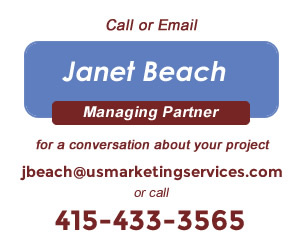 US Marketing Services helps managers make strategic, management, and marketing decisions in one-on-one sessions or by facilitating meetings. Depending on what needs to be decided, the process is customized and may be best handled in discussions or in a series of meetings or off site retreats. US Marketing Services often designs, manages, and facilitates company meetings where the goal is to bring groups together for productive problem-solving, opportunity analysis and decision-making.